We are delighted to announce that Tapestry Compliance has won another prestigous award. 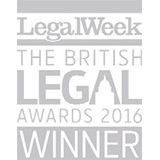 At the British Legal Awards in the City we were awarded the Specialist Law Firm of the Year. The judges noted the stella clients we work with, our strong growth and our commitment to corporate responsibility.